I arrived in Taipei on Oct 4th 9am. My sister Wennie and her husband came to pick me up and drove me to my parents home. The flight was smooth. I tried to sleep during the whole flight to adjust my time but seemd not really work. 313 Jiang Guo South Rd. Sec 1, Taipei, Taiwan. R.O.C. Lian Guan publisher was run by Mr. Yuan's father who is very old now. Mr. Yuan and his wife, who also graduated from Shi Jian Home Economic College same as me, are now doing the antique and jade selling business as the publishing business is very tough to maintain nowadays. Mr. Yuan and his wife told me that they don't really want to reprint Qin Fu because they don't know how many people want to buy it. 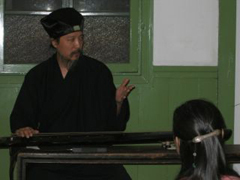 After all, Guqin is such a professional field, not many people know about it. However, once a while, there still are some people was ask them for Qin Fu, like me. So they reprinted 500 volumes in 1981. Mrs. Yuan said that they believe these 500 volumes won't sell out even after they all retire. The price of the Qin Fu is 5,000NT. I bought one set. It has 3 books. They are heavy like rocks. The book includes rich information about qin hand books, qin history, qin philosophy, qin people... etc,. I am glad I found it and now own it. 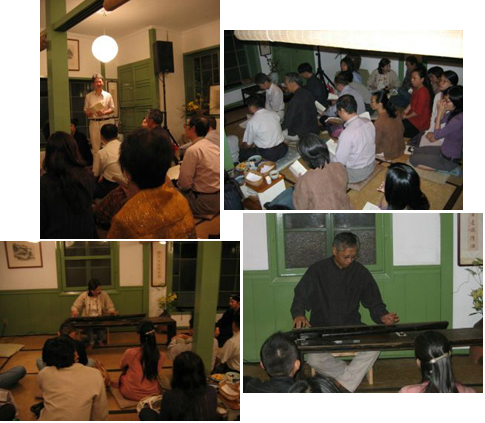 Oct. 6th 7pm at Zi Teng Lu tea house 紫藤廬茶藝館, Jung Ping had his moon festival qin conference there. I had posted this info on my yahoo blog and several qin friends who I met on the blog attended this conference. It was a very interesting experience. Jung Ping was wearing his taoist costume as usual and Renee who is now studying at Nan Hua with Jing Ping, also wear a Han style costume that she had someone in Shanghai custom make for her, both of them showed up together at the tea house. Renee even had herself in traditional make up, white face with small red lips. Looks very cute. Renee is JP's qin tong 琴僮 now who carries JP's qin all the time and follows him wherever he goes. This is usually a traditional way of learning from teacher, and usually the student can learn a lot not only the qin skill, but the life style, and the teacher's inner knowledge. Good for Renee. There were about 50 to 55 in the audience. Several of Jung Ping's shi-xong and shi-jie attended the conference. The famous qin maker Mr. Lin Lizhen also attended. The host of Ziteng Lu 紫藤盧, Mr. Zhou Yu 周渝 had an opening talk. Mr. Zhou said that silk string is the traditional and correct way to go. It should be propagate and Jung Ping is the best representative of promoting silk string qin. Mr. Zhou also mentioned that they are working hard to maintain this tea house as it is a historical building. They had been host so many art related activities, conference and classes in order to promote and keep the traditional Chinese culture and art. Ziteng Lu will be closed for 8 months starting at the beginning of 2007 for renovations. Therefore, this Guqin conference will be the last qin conference before the renovation. Before Jung Ping performed, he introduced his shi-jie, Miss Sun Yu-hang 孫于涵, Shi-xong, Mr. Chen Guo-deng 陳國燈 and the qin maker Mr. Lin Li-zheng 林立正. He also mentioned about his first qin teacher, Mr. Sun Yu-qin 孫公 毓琴 who had qin performance at the same place long time ago. Jing Ping was glad to see his shi-xong and shi-jie who remind him the good old day of learning qin with Master Sun. Jung Ping played 8 pieces total. The first half he played were Shi Shang Liu Quan, Yang Chun, Mei Hua 3 Nong, and Xiao Xian Shui Yun. The next half, he played Pin Sha, Yu Ge, Yang Guan with singing (it was Yi Gu Ren originally but JP changed it) and Yu Lan. Jung Ping's Yu Lan this time played different from the way we had heard in NYC. He gave more rests in between each part of the 4 paragraphs. JP had his Guqin CD published just a couple days before the conference. Jung Ping gave me one. I had him sign it for me. After JP's playing, he invited Miss Sun Yu Han 孫于涵 who is JP's shijei, to perform and Miss Sun played Liu Shui. I like Miss Sun's Liu Shui, very smooth and fluent. Later Mr. Chen Guo Deng 陳國燈 played a piece, Wu Yei Wu Qiu Feng by using his Ming Dynasty qin. As JP said, this conference was a kind of reunion of the Sun Yu Qin's students. After he finished his performance, some in the audience asked questions. One asked him if he used Qigong while playing qin. Jung Ping said as long as one has mind, the qi is exist. And the mind will guide the qi. 以意導氣. So I think the answer is Yes. There is another audience asked about his singing style. He mentioned about that when a judge working on a case, they follow the evidence. Where the evidence goes, they go. And therefore when he is singing, where the lyrics goes, his mind follows. Jung Ping then sing the Hu Jia Shi Ba Pai 胡笳十八拍 without playing qin. Many in the audience adored him. At this conference, I met my blog friends Wenyuan Quand Bright Liu. My eldest sister Wennie also attend this conference with me. Wenyuan Qu was a music teacher at Fuhe Junior High School 福和國中 and just retired this February. She is interested in Qin songs and poetry. Her personal website has one video of my playing of Mei Hua that she had recored on Oct 8th at Ye Tang Tea House 冶堂壺茶空間. Wenyuan gave me a CD of her singing of Chinese classical poetries 中國古典詩詞吟唱. She was graduated from the National Defence University 政戰學校. Listen to her singing, I can feel her rich energy from her voice. She started to play Guqin not too long ago and likes to play qin songs. 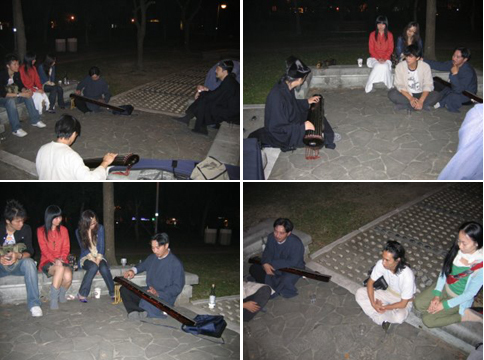 After the conference was finished, several young people decided to go to the Da Ann Forest Park near by to look at the moon, play qin and drink wine. There were 9 people together moved to the park. 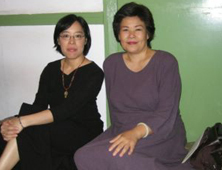 Both Jung Ping and Dexuan brought their qins and Dexuan brought a bottle of Gaoliang white wine to the park. 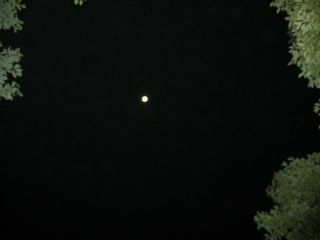 The sky was clear and the moon was bright. The newspaper says that it was the biggest moon in 9 years. There are two young qin makers who also play qin. Mr. Bright, and Mr. Zhen Dexuan. Mr. Bright's name is Liu Shan-wei 劉繕惟, 40 years old, had learned making qin with Mr. Chen Huide 程惠德 and Mr. Ling Lizheng. He just finished his first qin a couple months ago that he had spent one year and 4 months to make. Mr. Zhen De-xuan 鄭德宣, 39 years old, had learned making qin with Mr. Cheng Guoxin 陳國興. The qin that Dexuan brought to the park was a new qin that he also just finished recently. It has a beautiful lacquer work. As for a new qin, the sound quality is not coming out yet. While we were enjoy the playing, singing and drinking, there were 2 young dancers who were attracted (or curious) by this group of weird people and decided to join us. It was 2 am that the park yaji ended and Dexuan was so kind to drive 5 of us each home.